So this is Christmas, and what have I done? I haven't even mailed my Christmas cards yet. I know - shocking! I was thinking I'd write one of those holiday letters to accompany the photo cards that we threw together on Saturday after I finally admitted that there was no way in h-e-double-hockey-sticks that I was going to make handmade cards, even after Evelyn gifted me a Christmas paper pack for inspiration. See my problem (among many) is that I have a heightened sense of my own accomplishing. No, that's not a typo. I always think I can get way more done than is humanly possible in the time available. About midday I look at the clock, sigh, and start playing solitaire. If you don't know about Webkinz, and you have children, nieces or nephews between the ages of 5-11 who have computer priveleges, you should stop reading, toddle off to your nearest Hallmark store, and buy them one. Emma will only spend money on Webkinz, meaning that she has something like 8 (or is it 10?) of the suckers. Karl has fewer - maybe 6 - and likes it when I log in to earn him Kinz Cash when procrastinating on my unrealistic to-do list. KARL: Trenton is such a good chinchilla. EMMA: Yeah . . . I like his pink ears. Good chinchilla! Good chinchilla! ME: (calling out from adjacent room) CHIHUAHUA! KARL: Trenton is such a good chihuahua. 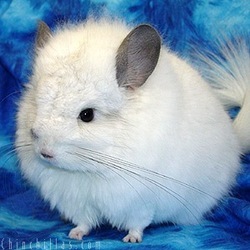 EMMA: Yeah, a "chinchilla" is a completely different animal. ME: (calling out from adjacent room) Actually, a chinchilla is a . . .
And here, luckily, I stopped and turned to my good friend Google. Because I thought a chinchilla was a pepper. Like some sort of ultra-spicy chile pepper or something. Chinchillas are rabbit-sized, crepuscular rodents native to the Andes Mountains in South America. So it's really quite fortunate that I didn't put one of these guys in my quesadillas, no? Awww, isn't he cute? But anyway, my mother listened patiently to my whining about needing more storage space, took a look at the gap above the cabinets and said "Put some boxes up there - that's all good space". Oh yeah. She's a smart one, that mom of mine. So I really, really, have to finish this blog post and get to Xpedex to buy some boxes. Because I really, really want to get this pigsty cleaned up and find the scoring tool for my Scor-it, which has been lost in the chaos somewhere. A couple of weeks ago Ev called and asked to borrow it. EV: Hey, can I borrow your Scor-it? I'm working on my Christmas cards. Again, not at all sure why I'm friends with Evelyn, who has an accurate sense of her own accomplishing and it's sickeningly high. ME: Well, you could, but I can't find the scoring tool for it. EV: Isn't it attached with a chain? Isn't that the point of the chain? ME: Well . . . yeah, but I took the scoring tool off the chain. ME: So it could be lost forever, of course. No, I took it off because I was scoring something large and I didn't have enough slack. You can take it off the chain to use it and then put it back again. If I were Evelyn, not having an available Scor-it would have been just the excuse I needed to stop working on Christmas Cards and settle in for a good game of Quizzy's Word Challenge, but of course Evelyn just scored the cards by hand and sent them out all prompt and handmade and stuff. Sickening. Last night they came for dinner and Ev was telling us about a convo with her husband, Desi. JOHN: Well that's what we do. We're men. We have to make sure it's not a trap! EV: Well it's not a trap. I really don't want anything. Plus, I already bought myself some stuff and put it under the tree. Like that Mini Scor-it that I bought the other day, Karen. ME: Ha ha ha! You put that under the tree? EV: Sure. I wasn't going to use it right away. I made it a present from the boys. JOHN: Why did you buy yourself a skort? It's winter! And then Evelyn and I started laughing so hard that tears were coming out of our eyes. John pointed out that she had actually said "Mini-skort" which seemed even more inappropriate winter attire. We laughed some more. I thanked John for giving me such good blog material and mentioned that I really needed to update because Pam was e-mailing me and Sarah offered me $50 if I'd just update, already. He claimed to be my muse and demanded half the $50. Nice. But now I really need to get to Xpedex!